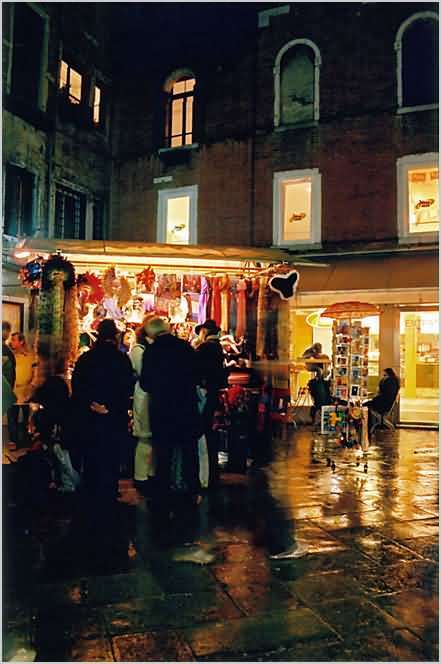 In the wet evening after the Venice Carnivale 2004. Despite the cold and dreary wet weather, there were still lots of people walking around during the night. Ironically, the crowds created lots of picture opportunities. I found this tiny kiosk stand in this square and took this shot at about 0.5 seconds. Being so still and silent, I think I was the ghostly image in the market, and not the people blurred by the long shutter speed.